In theory, a supernova thousands of light-years away could release gamma-rays that would fry most life on Earth. But the star must be positioned exactly right for this to ever happen, and there's no way to prove it. Until now. The Ordovician Extinction of 450 million years ago isn't nearly as famous as the K-T event that wiped out the dinosaurs 65 million years ago or the Permian-Triassic of 250 million years ago, which is often called the Great Dying and killed off 96% of all marine life and 70% of land animals. But the Ordovician was still plenty bad, driving more than 60% of all marine species extinct - and since nearly all complex life still lived in the sea back then, that was particularly devastating. We still don't know what exactly happened with the Ordovician - we know that there were two separate major extinction events separated by about a million years. Carbon dioxide was heavily involved in one of these extinctions, which suggests a likely culprit for at least one of them was extreme volcanic eruptions. It's the other extinction event that defies easy explanation, and the quest to explain this mystery has led a small group of scientists to put forward a radical hypothesis: it was all caused by a gamma-ray burst. Specifically, this burst must have come from a massive stellar explosion known as a hypernova - an explosion at least a hundred times more powerful than the average supernova - that happened about a thousand light-years away. Certainly, if a gamma-ray burst from an extremely powerful hypernova ever did hit Earth, it would be utterly devastating. A powerful burst lasting just ten seconds would be enough to strip the planet of half of the ozone layer, bathing all organisms near the surface in lots of ultraviolet radiation. Indeed, surface-dwelling organisms did seem to be the first to go in one of the extinction events, but the problem is that a gamma-ray burst of this sort is so ridiculously unlikely. When first proposed back in 2003, this hypothesis was pretty much untestable, as there was no way to find evidence that such a burst had ever happened - as you might imagine, explosions as violent as hypernovas don't leave much evidence of their existence behind. Without any evidence that such a burst ever occurred, the whole hypothesis is pretty much worthless, scientifically speaking. But that may be about to change. Wilfred Domainko, a physicist at Germany's Max Plank Institute, says that, if the gamma-ray burst ever did happen, it most likely came from a globular cluster. Because the stars in these clusters are so tightly packed together, dead stars can become attracted to one another and merge. When they do combine, a massive explosion results, one big enough to unleash such a gamma-ray burst. The question then is whether any clusters were close enough to Earth for a burst to affect us. As far as Domainko is concerned, the odds are good that this has happened at least once in the last billion years. The Gaia Star-Mapper, a European Space Agency probe due to start work in 2013, will be concerned with mapping the positions and velocities of, among other things, all these globular clusters. Once we have that data, it would be possible to extrapolate whether any of these clusters were in just the right position in time and space to unleash a gamma-ray burst that could have caused an extinction event here on Earth. If one or more were in the right position to cause the Ordovician extinction, then that would seriously boost the credibility of the theory, although even then there's only a remote chance of actually finding fragments of the original hypernova. arXiv via New Scientist. 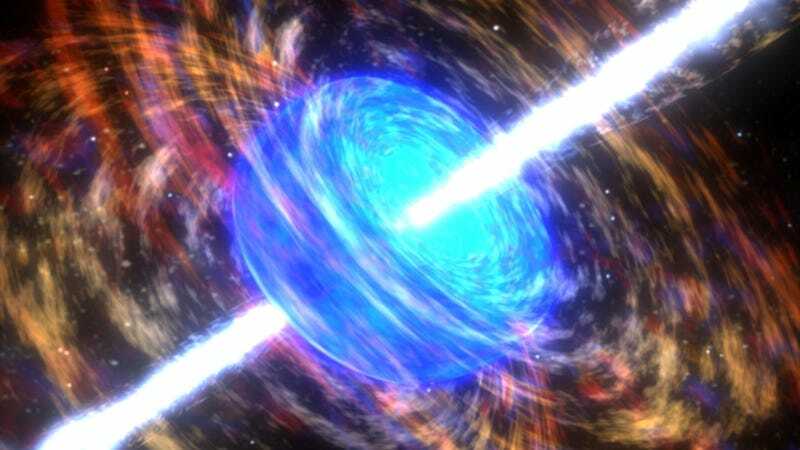 Artist's conception of a gamma-ray burst by NASA/SkyWorks Digital.